The PX265 is a rugged, industrial pressure transducer which offers three field selectable ranges in one unit. It features a 316L stainless steel pressure cavity which is machined from a solid rod eliminating any welds, seams or bonds. 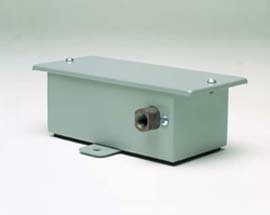 The PX265 incorporates a rugged NEMA-4 (IP-65) dust proof and splash proof enclosure with an external mounting bracket.